A clean environment contributes to better performance and higher productivity, especially in textile mills. Heavy dust and fiber fly can have a direct impact on the quality of the yarn. 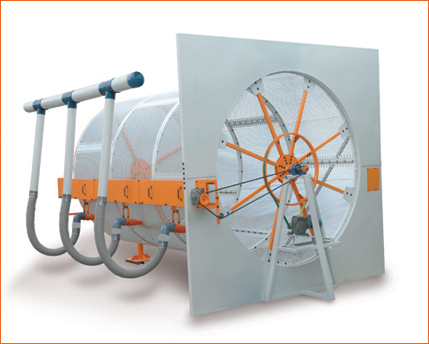 Coimbatore Air Control Systems, in answer to this need has introduced Rotary Drum Filter with high filtering efficiency and low maintenance. This filter is made of perforated MS sheets with study MS supporting arrangements. 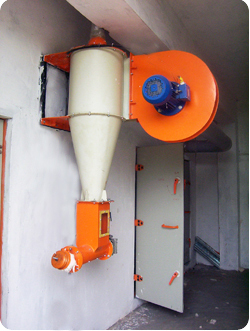 The drive for the drum filter is through 0.5 HP gear motor and the suction nozzle is connected to 5 HP high pressure suction fan. The dust removed from the filter is collected in the cyclone compactor / collection bag. 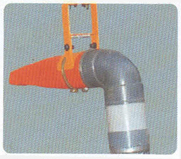 The linear movement of the nozzle synchronized with the rotation of the drum of uniform cleaning and the nozzle is specially designed for optimum suction pressure. 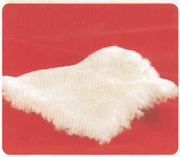 The synthetic type of filter media is fixed on the surface of the rotary drum to clean the cotton fiber / dust from the department exhaust trench with high filtering efficiency and less pressure drop.